Home » Extraterrestrials » An alien graveyard in Rwanda! The bodies were supposedly stacked in groups of five (although the report does not say whether this was vertically, one on top of the other, or side by side). 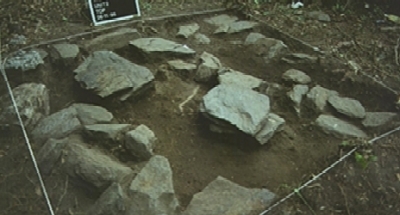 The only photograph reproduced with the report does not show any bodies, just a collection of rocks in a small trench. Dr Childs believed that “the two hundred aliens were part of a single landing party that encountered a deadly virus… Some of them must have survived because there is no evidence of a spaceship to be found”. It’s difficult to know where to begin… Firstly, there are no independent references to be found to a Dr Hugo Childs: they all go back to this story. If we want to be charitable, we might speculate that it is early in his career and that he has not yet published any research. On the other hand, he is presumably attached to some kind of research institution (a museum or a university, perhaps), where one might expect to find reference to him as a member of staff or as an associate. But there is nothing. All we can know about Hugo Childs comes from this one press statement. Next, the source is The Weekly World News, which is hardly a prestigious journal of record. A recent story challenges parents to prove Santa isn’t real by not buying their children presents for Christmas! While one may applaud a sentiment that attempts to subvert the commercialisation of a religious festival, the newspaper reports it as a serious scientific experiment. As with the Rwanda graveyard story, an “expert” is on hand to provide quotes, but we know nothing about who he is or in what subject he is supposed to be an expert. Upsetting children, perhaps. Then there’s the reporter, Erik Van Datiken. He is The Weekly World News’s reporter on all things alien, including such unmissable stories as Aliens Destroyed Atlantis, which has a rather cute graphic of aliens and cattle, or Titanic Sunk by Underwater UFO, a revelation that means at least two Hollywood blockbusters will have to be remade. My favourite story concerns the hospitalisation of chanteuse Amy Winehouse for stress induced by crop circles in her hair! He has been working for the paper since at least August 2008, when the first story under his name was published. And what an illustrious name it (almost) is! Doesn’t it remind you of someone? Yes! It’s a close linguistic relative of Erich von Däniken, the world’s foremost expert on alien intervention in human history. Needless to say, this story is a poorly constructed hoax. Yet it is a depressing commentary on contemporary attitudes that it spread rapidly throughout the blogosphere and UFOlogical corners of the web as a serious news story that, in the words of “Dr Hugo Childs” “will change the world”. I won’t be holding my breath waiting for The Weekly World News’s promised updates on the story. Indeed not. The most recent story by Mr von Datiken is UFO in clouds, a story posted on 29 January 2010, it concerns a video of moving clouds with another cloud behind them, moving more slowly. From this, Mr von Datiken concludes that it is a UFO hiding behind the faster moving clouds! Alas, the video is no longer visible (“because the YouTube account associated with this video has been terminated”, a good sign that it was not what it was claimed to be). We can only hope that Mr von Datiken is restored by his employer to his rightful position of reporting the stories no-one else has the courage to cover. 11 Responses to An alien graveyard in Rwanda! The Weekly World News is a fairly well known satirical magazine in the US (famous for Bat Boy, Elvis sightings, and a hilarious series on Saddam Hussein and Osama Bin Ladin’s doomed romance). One of my favorite articles came out on Hanukkah, and described how a rabbi managed to drive all the way across the country on a single tank of gas. I think the problem is that it never really jumped to other countries, so you get the Pravda reporting on this. Yes, you’ve hit the nail on the head. People who take their fringe views seriously (like certain UFOlogists) will jump at any story that appears to support their beliefs. They will swallow it uncritically and regurgitate it so rapidly these days that the original source becomes lost. This is the power of the internet! Describing the article as a ‘poorly-constructed hoax’ seems unfair to the author. A hoax implies that he’s trying to fool people into believing that it’s true. When it’s in a publication that contains stories about the Curiosity rover running over a Martian cat, I don’t think you can accuse them of deception. It’s a joke – hardly their fault if some people are daft enough to take these things seriously. The difficulty with dealing with something like this is that I first became aware of it through the UFO sites that were repeating it uncritically. Not then knowing that the original report was a joke rather than a hoax (and isn’t a hoax a joke of sorts, anyway? ), and never having seen any other stories from that source, I wasn’t aware of the satirical nature of the publication (and nor were the UFO buffs who repeated it). I’ll be more careful to look at the type of publication that carries the original story in future. Depends on the nature of the hoax. If it was to get people to really believe that crap, it’s fraud. If it’s just satire, it’s a joke. Either way they’re doing it for money and people are stupid. Cue Orson Welles reference. There is surely a meaningful distinction between a(n) ‘hoax’ and a ‘joke’, in that a spoof can be said to reward the incredulous (even if only with a chuckle) whereas an hoax is intended to defraud the credulous. Put simply, satire only functions when one doesn’t actually believe it, whereas hoaxing only works when one does. I fully expect that in a few thousands of years, there will be some who will claim that The Weekly World News never actually existed, but was merely symbolic of a higher truth in an higher realm of spiritual consciousness. One second thought, make that any minute now. I enjoy your site. Keep up the great work. The WWN, now that you mention it, IS a higher level of consciousness! Man, I’ve been looking at it wrong this whole time! They are just trying to detract us from the real issues at hand, like the Reptilian Queen, and Kim Jung-Un and Obama’s love affair! I think we should worship the creators…. The Weekly World News sounds fun. Now I really must get some work done. The Weekly Woprld News IS a satirical site, much like The Onion. The Onion published an article last week naming the leader of Norther Korea as the Sexiest Man Alive – and a Chinese newspaper picked up the story and congratulated him! More proof that the source should be checked before repeating it! To be honest, the Internet is so full of lunacy these days that it really gets quite hard to distinguish those who are merely being satirical from those who actually mean what they write. I don’t think that it was an unreasonable assumption given all sorts of unimaginable stuff this website ends up dealing with.